We know how precious your wedding days are. So to make them perfect, you need an amazing venue with open and covered spaces, delicious food, beautiful decorations and we have it all. Mayfair Lawn offers luxurious, stylish and multi functional, contemporary spaces which can host up to 4000 people. Mayfair Lawn has 2 centralize A.C. Banquet halls each has capacity of serving 400 guest together. These are multi functional, contemporary and suitable for business meeting, product launch, high profile cocktail dinner, fashion events, wedding or a board room discussion. 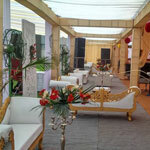 Banquet hall Mayfair Lawn is of top-notch quality supporting the requirements of multicultural guests. We can add customizations to the banquet hall based on the varying requirements of our visitors. 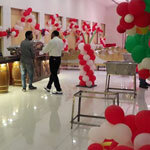 We do arrange enough assistance for setting up the party hall with our dedicated staff. We serve you according to your requirements. Forget not to book our banquet hall for your next corporate tour requirements, so that you enjoy the pleasurable experience. 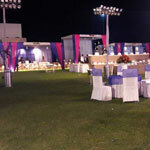 Be it a corporate event, or a wedding party, or partying need, you can rely on the excellent banquet facility at Mayfair Lawn. To embody the 'Indian heritage' in the elegance of its ambience and hopitality, the warmth of the welcome, the sophistication of the services, and the art of exceptional cuisine. If you are planning your next venue for any of your occasion , this is a place you would like to select to invite your guests for a gala celebration.